April Discount Sigma Code save 10% plus Free Gift with purchase! 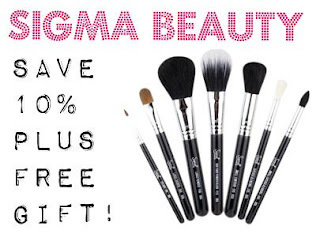 You may have seen my blogpost a few days ago whereby if you spend over $30 (£18) at Sigma Beauty you get a free eyeliner brush but also you can save 10% off your full order until 30/4/12 by visiting Sigma here and entering the code APRIL2012 at the checkout! What is on your Sigma wishlist?